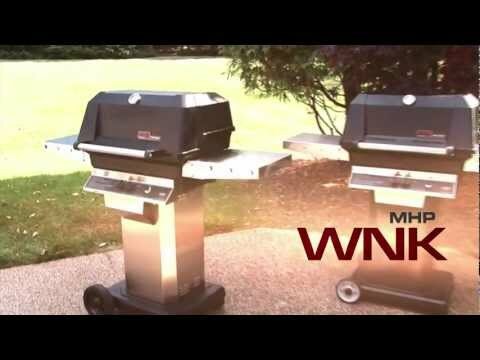 This MHP gas grill features a high profile, thick, cast aluminum no rust exterior housing that accommodates large cuts of meat and features a Sta-Kool handle which rolls to make opening the hood easy. The two (2) SearMagic cooking grids offer 365 1/2 square inches of cooking area and even comes with a SearMagic secondary cooking rack. The anodized aluminum SearMagic cooking rack is reversible with one side wide-ribbed for grilling steaks, chops, burgers or ribs and giving them sear lines. Flip it over and its smooth surface is perfect for fish, vegetables or even breakfast foods such as French toast. The 30,000 BTU stainless H-type dual burner has burner ports that are uniform in size and shape with even flames on each port providing superior cooking performance. Includes black, aluminum post and black, Nu-Stone patio/deck base mount with stainless steel tubing and propane hose and regulator with fuel level gauge, one (1) stainless steel side shelf and stainless grease cup for easy clean-up. Some assembly required for this MHP BBQ Grill.